A captivating story of love, family and survival . . .
Life is tough on the cobbled backstreet courtyards of Abbey Street, Warwickshire, in the 1840s: boys are destined for the pit and girls for the mill. Despite this, clever, feisty Maryann is happy there – until her mother dies. Her family collapses, leaving Maryann coping with everything, exhausted and lonely. Especially as Toby, the boy she is set on marrying, insists they wait. When things are at their bleakest, Maryann is offered a lifeline: a position as nanny to the daughter of the mill owner, Wesley Marshall. Though the house is filled with secrets and heartache, there is kindness, too, and to Maryann’s surprise she grows close to Marshall. But their relationship has not gone unnoticed and it threatens to unleash a world of problems on them all . 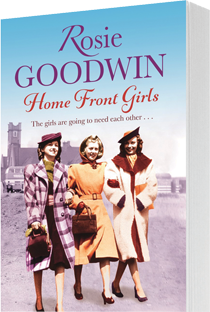 . .
A gripping and emotional WWII drama about three unforgettable women who kept the country moving during its darkest hours. Dotty has never known a life outside of the orphanage where she grew up, let alone love. Lucy is the sole carer of her little sister, now that her brother has gone to war. Annabelle has led a life of privilege but everyone has to pinch the pennies now. Adjusting to life on the shop-floor at Coventry’s only department store is hard enough, but then the bombs begin to fall… One thing’s for certain, the girls are going to need each other. A dramatic and emotional story of one girl’s struggle to keep her family together, set against the horrors of the WWII. To the outside world, Charlotte is the privileged daughter of the local vicar. Behind closed doors, however, she is the prisoner of her controlling father. As she grows up, Charlotte longs for freedom, but her captivating innocence leads her into trouble. Sent to Ireland to hide a shameful pregnancy, she discovers that once again her father has deceived her. She is forced into a convent’s harsh and humiliating regime, where she must eventually give up the one thing that makes her life worthwhile. When Charlotte returns to England, older than her years, she chooses to forget the past. Becoming a London midwife, she longs only to help other women at this hardest and most joyful moment in their lives. But her deep compassion, and desire to prevent anyone else suffering the same horror she did, leads her into a darker and more dangerous place. An abandoned baby. A damaged child. Can Rebecca escape her broken past? Abandoned outside a hospital, baby Rebecca didn’t have a good start. When her adoptive mother dies, her greedy aunt takes her in, but hers is not a happy home, and soon Rebecca’s life is worse than ever. She longs to escape to the circus that visits her town, with its carefree life and freedom from her past – but will she ever find happiness? Sometimes the past really does come back to haunt you . . . The old manor house has stood empty for years, left to rot since the last master of the Fenton family died. Until Jess Beddows steps inside, and feels she has come home. Against her family’s wishes, she buys the house, promising to bring it back to life. Upstairs, in an attic room left untouched for a century or more, she finds a journal. It holds the heartbreaking tale of Martha, and of the cruel, entangled lives of the house’s servants and masters nearly two hundred years before. As Jess is drawn into their tragedy, the whispers begin. Before long, everything she loves will be threatened by violent emotion and long-kept secrets. Can she survive the echoes from the past? A baby rescued from the snow. A wealthy family’s tragic secret. A girl determined to make her mark. One winter’s night, Molly Earnshaw rescues a newborn baby from the snow and changes two families for ever. The tiny girl grows into a beautiful and gifted young woman. Although devoted to Molly, Amy has far-reaching ambitions – encouraged by her neighbour’s son, Toby, she longs to move beyond ribbon-weaving to designing the hats and clothes the ribbons adorn. Amy’s dreams seem to be coming true, but as more secrets are revealed and Amy is caught between two worlds, she must choose where her heart truly belongs. When Adina and her family are forced to flee Cologne to escape the vicious menace of German invasion in 1938, leaving their luxurious lifestyle is painful. Harder still is finding herself a refugee in a foreign country. 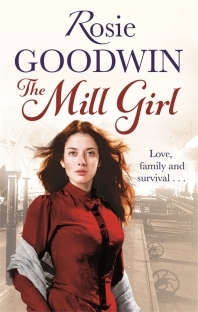 But Adina is a compassionate and determined girl and as they settle into a new life in the Midlands she finds the strength to survive. When a mysterious fire kills her adoptive parents, Madeleine’s worst fear comes true – she and her beloved brother Oliver are separated. Worse still, Maddie is blamed for starting the fire and, labelled a difficult child, she is sent to a children’s home. Far from idyllic, and buried deep in the countryside, the home well conceals the misery of its young occupants. Subjected to a harsh regime of abuse and degradation, Maddie makes a brave attempt to escape. But her brief weeks of freedom are thwarted when she is caught and taken back to River House.